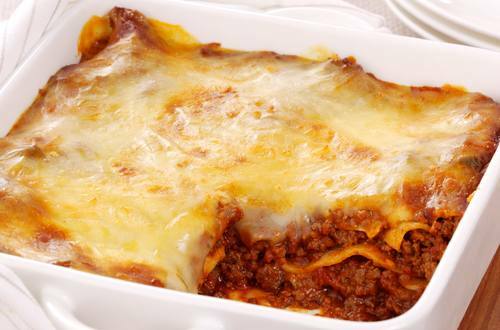 Lasagne is a timeless family favourite. This warm, hearty dish is easy to prepare and full of flavour. 1 Preheat oven to 180°C. Heat oil in a frying pan and brown mince and mushrooms. Add Recipe Base, tomatoes and water, bring to the boil and simmer for 15 minutes. 2 To prepare white sauce melt spread in a saucepan, add flour and cook for 1 minute, stirring constantly. Remove from the heat and gradually stir in the milk until smooth. Return to the heat and stir constantly until the sauce thickens and comes to the boil. Cook, stirring for a 2-3 minutes. 3 Lightly grease an ovenproof dish and cover bottom with a layer of meat sauce. Add a layer of lasagne sheets, cover with meat sauce. Add another layer of lasagne sheets and cover with the remaining meat sauce. Cover with white sauce; sprinkle with mozzarella and bake for 20 minutes, or until top is crusty and golden.